In a year defined by so much anger and conflict in the gaming world, it’s important to celebrate the things that bring us together. While a vocal minority is fighting tooth and nail to keep non-conforming voices and ideas out of this culture, many people are fighting back in a positive way. Some make videos to promote awareness and inclusiveness; some organize legal defense funds to protect harassment victims; some appeal to their biggest fans to help fight negative conduct in their communities. On the other hand, some people do what’s most natural to them: they make games. Sportsfriends is a collection of four wonderful games (BaraBariBall, Hokra, Johann Sebastian Joust and Super Pole Riders) in one package. You can’t play them alone, nor can you play them online; instead, you’ve got to invite some friends over to play the old-fashioned way. It might seem quaint or even misguided in 2014 to ship a multiplayer game without online play, but in this case, the effort of bringing people together is worth it. Each of the four games is easy to pick up, delightful to play with others, and impressively deep in its design. But without question, the star of the show is Johann Sebastian Joust, a two-to-seven player cross between musical chairs and group waltzing. Each player has a PlayStation Move controller in one hand and must match their movements to the tempo of the music: when it’s slow, move slowly, and when it’s fast, move quickly. The goal is to knock other players out by shaking their controller beyond its threshold and to be the last one jousting. It’s a ridiculous, wonderful, intuitive and brilliant piece of design, and it’s never not a joy to play. The Sportsfriends package brings all four games together in one unique bundle that seems completely determined to put a smile on your face. The games all share a bright, colorful and approachable aesthetic, and instructions are clear and concise to empower newcomers to pick them up without much of a struggle. In the end, what you get is the most powerful piece of gaming evangelism I’ve ever seen. When women and other minorities are being made to feel unwelcome in video games, it’s crucial that we fight back and help make games safe, fun and approachable for everyone. 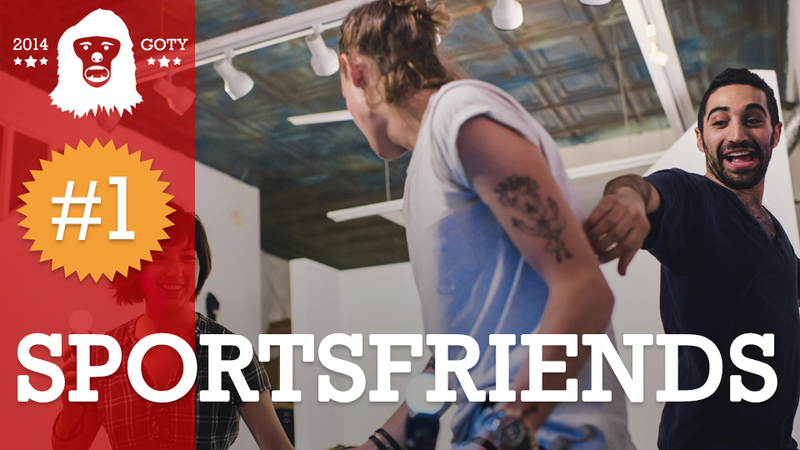 Sportsfriends is the perfect tool to bring new players into the fold and to help reassure those who have left the hobby behind that there’s always going to be a place for them. Sportsfriends, at first glance, is very strange to behold. Its mechanics seem rudimentary, its pixel art doesn't explicitly pander to veterans of the third and fourth console generations, and (in the case of Johann Sebastian Joust) its use of motion controls seems so 2006. For a while, I paid it little mind. Then, in 2013, I fumbled into a large game of Joust being played at PAX Prime. Joust is unlike any video game I've played before. Honestly, it might not even be a video game. You can see Nick's description above for a breakdown of the mechanics, but reading about the game is is a far cry from playing it. In that crowd we ran, and jumped, and laughed. Joust is, in its best moments, the purest form of play I've ever encountered. Explicitly physical and active, the only change from playground roughhousing is the presence of software moderating the game. Playing Joust with the right group is, for lack of a better word, jubilation. While Joust is absolutely the crown jewel of Sportsfriends, the other games should not be ignored. Super Pole Riders never fails to trigger fits of laughter, BaraBariBall's action is undeniably robust, and Hokra is possibly the most competitive game I've ever played. Every title in Sportsfriends is deeply refined and utterly potent. They're easy to learn, but once learned, cause the player to feverishly want after mastery—and to play round after round in pursuit thereof. I play a lot of games (too many, perhaps), and even follow some pro sports. Enthusiasm for these is easily measured in decibels—the amount of noise made by players or observers as they react to the action of play. In a field containing eSports darlings, first person shooters, LAN parties, and even basketball matches, the biggest, loudest, most enthusiastic and invested reactions I've observed all year have come from people playing and watching Sportsfriends. Consider that for a moment.